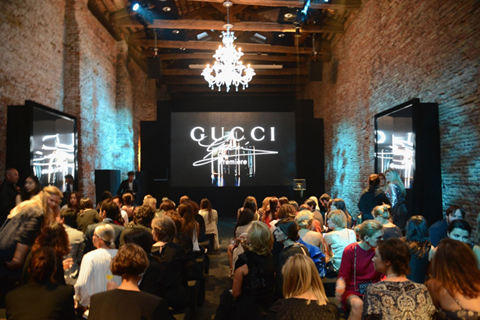 On September 1st Gucci Parfums revealed its new fragrance for women, Gucci Première, to top international editors. The private cocktail and dinner was held at Granai Cipriani in the presence of Gucci Creative Director Frida Giannini, Gucci President and CEO Patrizio di Marco, the face of the new fragrance campaign Blake Lively, the film director Nicolas Winding Refn and P&G Prestige Vice President Luigi Feola. During the cocktail, Nicolas Winding Refn presented his short film which was shot at the famous Sheats Goldstein Residence in Los Angeles. The Gucci Première couture gown worn by Blake Lively in the campaign was on display at the event. Blake Lively wore Gucci one of a kind sleeveless deep v-neck cocktail dress, fully embroidered with cherry overlapping palettes and raised flower detail around the neckline, burgundy python high heel sandal with metallic spike detail in the back, horsebit bracelet and ring in 18kt pink gold, black corundum and black diamonds and horsebit cocktail ring in 18kt pink gold, black corundum and black diamonds.